A new magnetic micro-robotic technique for assembling components of the complex materials used in tissue engineering* and 3D printing of cell materials has been developed by Researchers at Brigham and Women’s Hospital (BWH) and Carnegie Mellon University. Described in Nature Communications, the technique allows for precise construction of individual cell-encapsulating hydrogels (such as cell blocks). Described in the Jan. 28, 2014, issue of Nature Communications, the research was conducted by Savas Tasoglu, PhD, MS, research fellow in the BWH Division of Renal Medicine, and Utkan Demirci, PhD, MS, associate professor of Medicine in the Division of Biomedical Engineering, part of the BWH Department of Medicine, in collaboration with Eric Diller, PhD, MS, and Metin Sitti, PhD, MS, professor in the Department of Mechanical Engineering, Carnegie Mellon University. The current process for “bioprinting” cells for tissues or organs (such as a pancreas) is limited because the process can’t be modified or reversed. For example, misplacement of an ejected droplet or clogging can cause bioprinting to fail, the researchers say in the paper. “Moreover, simultaneous coding of rigid and soft micro-components into 3D functional materials has presented a signiﬁcant challenge,” the researchers said in the paper. 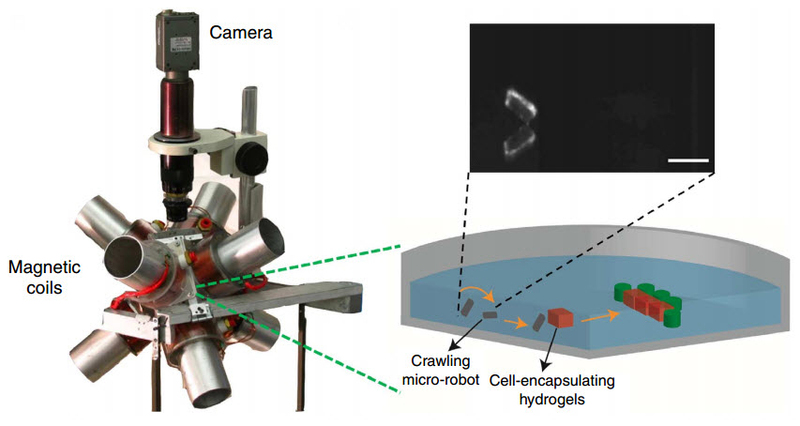 The researchers demonstrated that micro-robotic construction of cell-encapsulating hydrogels (used for used as scaffolds or supports for cells) can be performed without affecting cell vitality and proliferation. 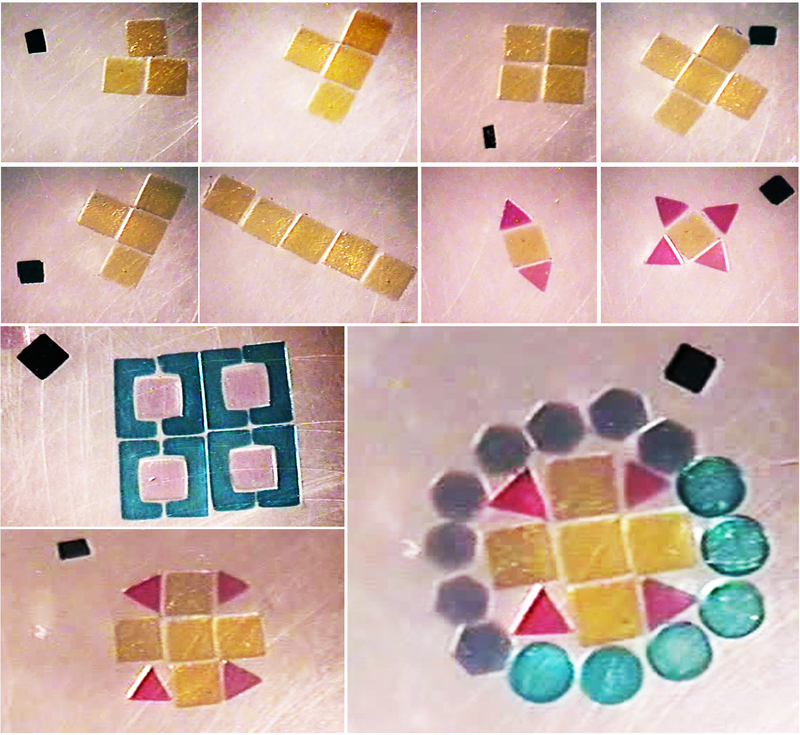 The micro-robot, which is remotely controlled by magnetic fields, can move one hydrogel at a time to build structures. This is critical in tissue engineering, as human tissue architecture is complex, with different types of cells at various levels and locations. They spatiotemporally coded a heterogeneous group of objects including rigid copper bars, polystyrene beads, silicon chiplets, polydimethylsiloxane (PDMS) blocks, and cell-encapsulating hydrogels in a ﬂuid environment suitable for cell growth and culture. This approach offers high precision in 2D and 3D, as well as the capability to code a combination of soft and rigid materials together, according to the researchers. The coding resolution is tens of microns and can be adjusted with the size of the micro-robot and the resolution of real-time imaging. Numerous micro-robots can also be used together in creating a design that can be used by a bioprinter to generate tissue and other complex materials in the laboratory environment. “Our work will revolutionize three-dimensional precise assembly of complex and heterogeneous tissue-engineering building blocks and serve to improve complexity and understanding of tissue engineering systems,” said Metin Sitti, professor of Mechanical Engineering and the Robotics Institute and head of CMU’s NanoRobotics Lab. “The coding and manipulation methodology developed here can find broad applications in areas such as diagnostics, regenerative medicine, microphysiological system engineering, pharmaceutical research, biological research, and microscale manufacturing,” Demirci explained to KurzweilAI in an email interview. “The microrobot can scan among cells, manipulate them, remove targets or change their orientation at a scale what we could not control before. It can be thought of as a microscale tweezer that can pick and move cells and cellular aggregates in a 3-D fashion. “Few of the previous [tissue-engineering] methods have shown the manipulation of building blocks (e.g., cell-encapsulating hydrogels) with a high precision at tens of microns, and none of them has yet presented the coding of a group of soft and rigid materials together with reconfigurability. There is no existing method to really manipulate cells or cell aggregates one by one with control over time and position. It can place a single cell encapsulating cell or a cell aggregate relative to another complex structure and place it precisely. * Tissue engineering and 3D printing have become vitally important to the future of medicine for many reasons. The shortage of available organs for transplantation, for example, leaves many patients on lengthy waiting lists for life-saving treatment. Being able to engineer organs using a patient’s own cells can alleviate this shortage and also address issues related to rejection of donated organs. Developing therapies and testing drugs using current preclinical models have limitations in reliability and predictability. Tissue engineering provides a more practical means for researchers to study cell behavior, such as cancer cell resistance to therapy, and test new drugs or combinations of drugs to treat many diseases. Complex functional materials with three-dimensional micro- or nano-scale dynamic compositional features are prevalent in nature. However, the generation of three-dimensional functional materials composed of both soft and rigid microstructures, each programmed by shape and composition, is still an unsolved challenge. Here we describe a method to code complex materials in three-dimensions with tunable structural, morphological and chemical features using an untethered magnetic micro-robot remotely controlled by magnetic fields. This strategy allows the micro-robot to be introduced to arbitrary microfluidic environments for remote two- and three-dimensional manipulation. We demonstrate the coding of soft hydrogels, rigid copper bars, polystyrene beads and silicon chiplets into three-dimensional heterogeneous structures. We also use coded microstructures for bottom-up tissue engineering by generating cell-encapsulating constructs.